All South Korea, South Korea - In August SalvoNews explored the application of robotics to waste management and recycling (Can green robotics rescue reuse? 10 August). The Finnish company spotlighted in that piece imagined a future where advanced rubbish vehicles analyze their cargo and communicate with robotic waste processing assembly lines to minimize waste. But just how futuristic is that vision? Is the noisy, street-clogging ritual of rubbish collection really so inevitable? Surely we could do better. A fundamental redesign is easier to imagine when building a brand new city from scratch, unrestricted by old-fashioned infrastructure or narrow corridors. Indeed these forward-thinking smart cities are quietly popping up around the globe, and some are promising a revolution in recycling. 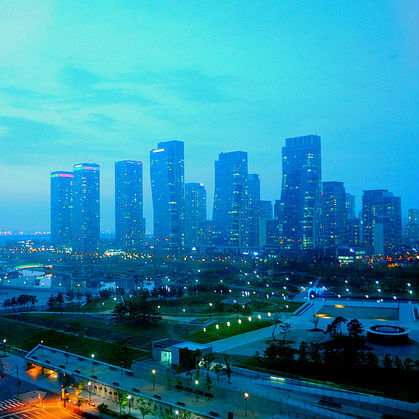 Songdo in South Korea is one such city. Just a half hour west of Seoul, this pricey business district was built with waste management in mind. It boasts a unique pneumatic waste system that completely bypasses the need for rubbish collection. In Songdo taking out the rubbish is more like flushing a toilet. Not only is the waste easily disposed of, but it is also processed to maximize recycling. Though this might sound like a game-changing development, green-minded cities like San Francisco and Los Angeles achieve comparable recycling rates amid conventional infrastructure. Amsterdam and Barcelona are vibrant examples of far older cities with impressive environmental credentials, neither of which had to tear up their sidewalk or sack fleets of bin men. If the environmental benefits of Songo's top-down, rational structure are not unique, what of the drawbacks? For all its good intentions and environmental accolades, Songo remains a cultural ghost town compared to any of the aforementioned cities. Crowds can be horrible and nobody likes a traffic jam, but efficiency is not what makes a city worth living in. With today's acceleration of technology, the concept of a super advanced smart city is intriguing. But if the emergence of Utopia has occurred, you think it would have dominated global headlines. What does it say that in 2017, most non-South Koreans could name only a single city from that country; Seoul?